"Cyborg zombies, virtual realities, wisecracking mercenaries, and a sentient computer virus named Weedly who likes cowboy hats, 80s music, and playing God." Soon after cybernetic neural implants became mandatory for all StratosCorp citizens, the Weedly computer virus was unleashed. Allegedly designed by an underground anti-Cybernetics cult, Weedly swept the nation, turning anyone equipped with neural cybernetics into an Infect–a mindless killer drone. Now, the remaining population of the world huddles behind the Firewalls, areas of the globe designed to keep Weedly out. Beyond them, the only living are the Infects and a few surviving anti-Cybernetic cults. Lyan has spent his seventeen years in a secure cell, being trained to fight Infects. Bored and lonely, connected to the outside world only by a video feed, Lyan has used his neural implants to discover a new world—the StratosGrid. Here he finds a dazzling new frontier, and a wealth of forgotten information free for the taking. He also finds a girl named Jazzy. A fast friendship develops, but Lyan soon learns that Jazzy may harbor a terrible secret. Something in the Grid is keeping her prisoner—something that doesn’t like Lyan. Decker used to be a member of the largest anti-Cybernetic cult. Now he’s a Firewall-hired mercenary. After a nightmarish Infect encounter that cost him his partner and a little of his sanity, he has spent almost a year recovering. Now he is wanted for one last mission—one the Firewall tells him could bring an end to the virus once and for all. But as Decker begins to uncover the truth behind what happened to him a year ago, he can’t help but wonder if the Firewall, the last bastion of humanity, can really be trusted. Demo knows that he used to be one of the men in white coats who now torture him in the name of science. He doesn’t remember what happened to him, but he does know that if he got out of his cell, all of the others would be dead in seconds. But he has an ally who has a plan for his escape. In return, all Demo has to do is kill a boy named Lyan. Escape. Kill the boy. It’ll be easy, Weedly says. The Firewall Saga has not been reviewed yet. 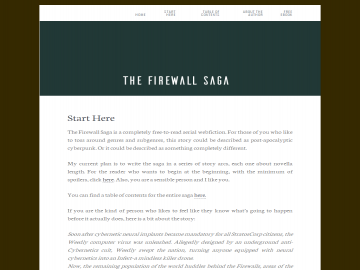 The Firewall Saga has not been recommended yet.